Mix them all in a jar and shake vigorously. 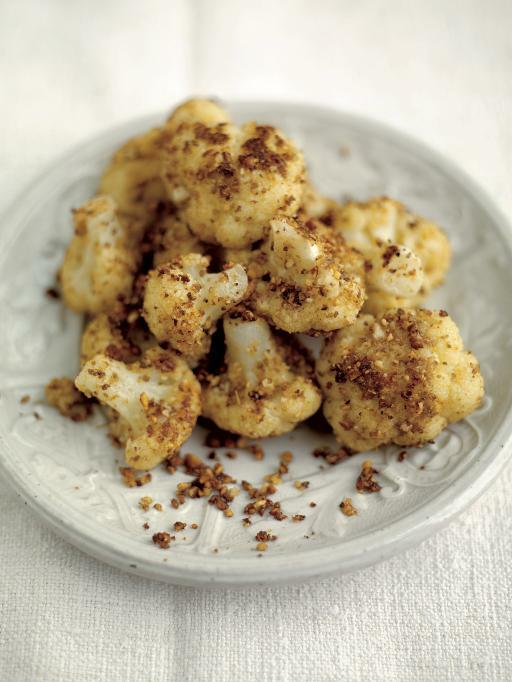 Then – taste with your finger, and adjust to balance the flavours: salty, sweet, hot and sour. No one flavour should predominate, but you should be able to sense them all. This salad dressing, freshly made, is superior to anything you can buy at the store. It will keep in the fridge for a couple of weeks, but you’ll likely use it in a day or two. Double it to make your labour more productive! 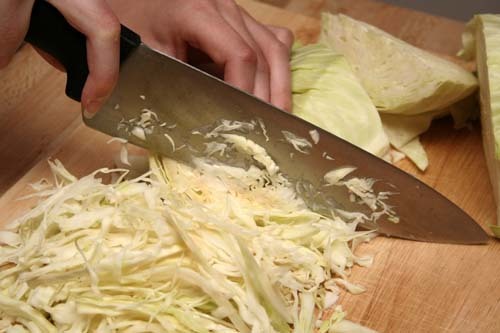 Lots of chopping here. Clear yourself lots of space, use a large board and a big bowl, so you can move fast. And it goes without saying: use a sharp knife! 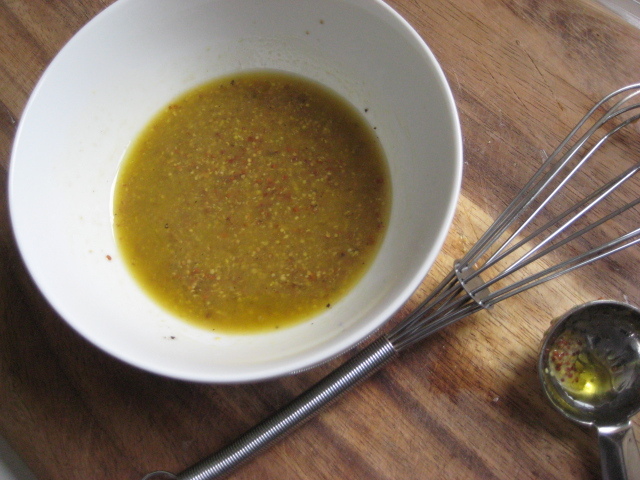 As with the vinaigrette above, taste your dressing mixture and adjust. If you want a little bit of kick to the coleslaw, give it a good squirt of sriracha sauce. It should taste piquant, but not hot. Toss the veggies, then add the dressing five minutes before serving. Leftovers are great the next day. In bowl, beat egg; mix in bread crumbs, onion, chives, lemon rind and juice, mustard, salt and pepper. Mix in chicken; shape into 4–6 patties. Place on greased grill over medium-high heat; cook for 6 to 7 minutes per side or until no longer pink inside. The moisture content of ground chicken varies – use your own judgement with the breadcrumbs. You only need enough for the raw meat to hold together until you start cooking it. Once on the grill, it will firm up just fine. This is a method, more than a recipe. Gravy seems mysterious, but it’s not. There are several key points, which I’ll highlight in bold. This makes 3–4 cups of gravy, enough for the meal and for leftovers. Either a roasted chicken or a turkey will produce a lot of liquid, which is both fat and stock. You’ll use both for the gravy – a little bit of the fat and all the stock. You pour it out of the roasting pan and skim the fat off the top, somehow. I use a two-cup fat separator, available in kitchen specialty stores. It’s brilliant. Most of your gravy’s flavour will come from these two ingredients. Taste the stock – it will be very concentrated and delicious. It is gold. If possible, take the bird out of the roasting pan, and use it to make the gravy, because it will allow you to catch all the flavourful, caramelized bits at the bottom. As an alternative, you can use a large pot to make the gravy, but you need to work harder to make it taste great. After emptying the roasting pan (of bird and liquid) put it on the stove and add 2 T. of chicken or turkey fat. Then measure 2 T. of blending flour into the fat. Stir it into the fat and turn the heat up to medium (see photo above). 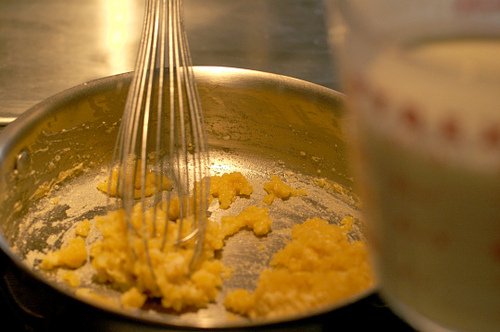 Allow this roux to brown a little. Prepare to add your stock. You probably won’t have 4 cups of stock, so add some commercially prepared stock (I like the stuff in a carton, because you have lots, and can put the leftovers easily into the fridge) to make up the difference, or, worst case scenario, add some Oxo stock (chicken or veggie). Some people save vegetable water (like potato cooking water) to add to gravy. In my view, it’s not flavourful enough.Taste it. If it’s as yummy as a soup, go ahead, otherwise, use commercial. You may not use all this stock, but have it on hand in a jug as you make the gravy. Add 1 cup of stock to the roux in the roasting pan all at once, and whisk vigorously to dissolve the fat/flour mixture. Keep heating until it Turn the heat way down and add another 1–2 cups. Let the gravy simmer while you stir and dissolve the hard bits on the bottom of the pan. What you’re doing here is deglazing the roasting pan. That gives you more flavour. Add some or all of the following: ¼-cup white wine, ground pepper, a little soy sauce or worcestershire sauce, or a small handful of herbes de provence. If you prefer a darker gravy, add a small shake of Kitchen Bouquet (gravy browning). Taste the gravy. Adjust the seasoning by adding salt or pepper. The gravy should taste robust. It’s a sauce, so it adds flavour to the meat, or whatever you’re pouring it on. It’s not a soup. You won’t eat it straight up, so it should be super flavourful and tending towards salty. If the gravy tastes insipid, you can fiddle by boiling it down (reducing it), adding some more of the optional ingredients (step 6) or, even some powdered chicken or veggie stock. Let the gravy simmer while you finish off the rest of the meal and get it ready to plate. At the last minute, adjust the thickness of the gravy by either adding more stock or a small shake of flour. It should be runny, like a soup, not thick, like a cream sauce. You can use this same method for beef gravy, except you’ll have virtually no water/stock from a roast beef – you’ll rely entirely on prepared beef stock. And you can also make a very good veggie gravy, using olive oil for the fat and veggie stock for the water. This is a summertime staple for us. 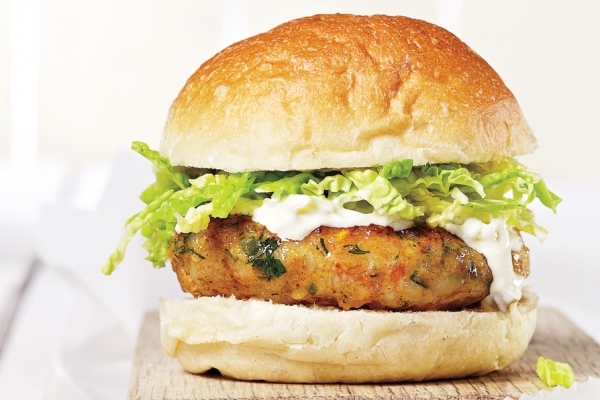 The secret ingredient is a single, whole spice, coriander seed, roasted slightly – it’s the only cooked ingredient. The little seeds lie in wait and then burst with flavour each time you take a forkful of salad and begin to chew. Mix the veggies. Prepare the dressing. Pour the dressing over the salad and refrigerate until ready to serve. This goes well with so many things, lunch or supper. In a large pot, soak the beans or soup mix overnight in cold water. Or, cover with water, bring to a boil, then turn off the heat and let stand for one hour. Drain and rinse the beans or soup mix. Put them back in the pot with 8 cups of fresh water, the onion and the pork hock. Bring to the boil and then simmer for 2-1/2 to 3 hours. Remove the pork hock and let it cool for 15 minutes on a cutting board. 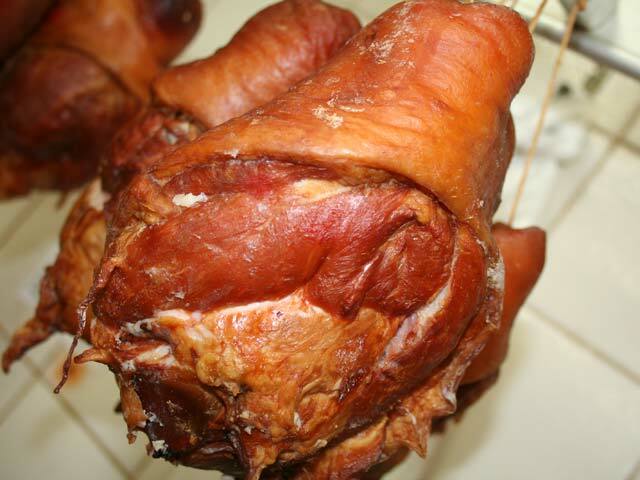 Peel away the skin, then use your hands to separate the meat from the tendons, fat and bone. Chop this delicious meat into bit size pieces and return it to the soup, and also add the tomatoes, chili powder and lemon juice. Bring it back up to boiling and simmer for another 20 minutes while you adjust the seasoning to taste (salt and pepper). You may be surprised how much goodness is in that stock, from boiling the joint of meat. It may require no seasoning at all – you just have to judge that. If it tastes a little sour (from the tomatoes and lemon juice), then balance with a teaspoon or two of honey. 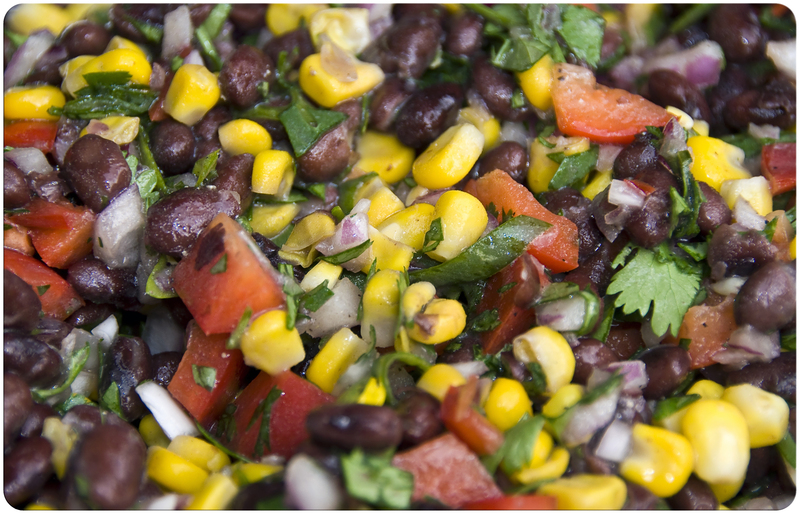 Optional: sprinkle a little chopped parsley, chopped cilantro or chives on top just before serving. Mix everything up well until you have a smooth sauce, lightly pink in colour. Fry the fish in a hot cast iron skillet in a little oil, a few minutes per side, until crispy and brown. Season the fish as you cook it, both sides. (If you’re using scallops, do not overcook, just two minutes per side is all it takes – don’t crowd them in the pan as you want any liquid to boil off rapidly.) Alternately, you can also barbecue the fish, but cook it fast and hot, so it’s brown on the outside, but still moist inside. Once cooked, let the fish cool, then break it into chunks with your hands. Warm the tortillas in the microwave for a minute in a tea towel, so they’re soft and warm. 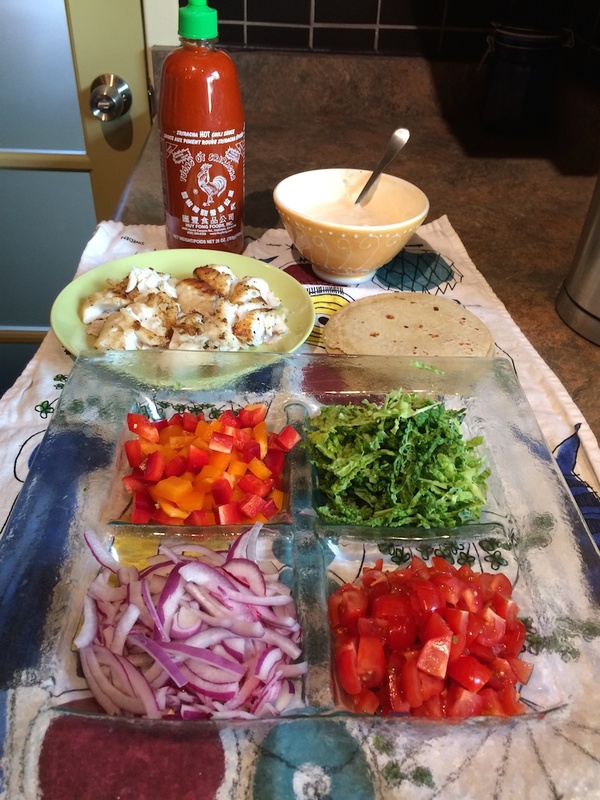 Assemble all your ingredients, and let everyone put their own tacos together, selecting their preferences. * Sriracha: the wonderful Korean-American invention, tastier and less hot than tabasco (but harder to pronounce), almost as thick as ketchup, and sold in a distinctive green-top bottle in Asian food stores (and maybe your supermarket). Fry the chicken strips quickly, until just after pink (don’t overcook them), then set aside in a covered bowl. 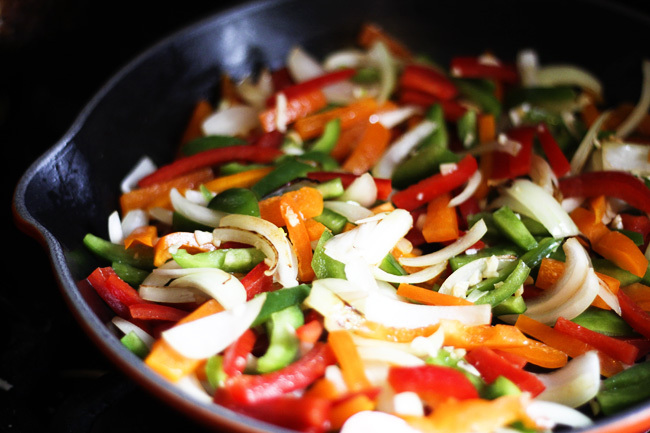 In a wok or large cast iron skillet, heat 1 T. cooking oil until smoking, then add the onion and ginger. Cook for 1–2 min. only, stirring vigorously. Turn the heat up to high, add the rest of the veggies except the bean sprouts, stir, and cover immediately. Leave them for 2 min. Add the stock or water (it should start boiling almost immediately). Cover for 30–60 seconds and let the veggies steam. Open the lid, add the chicken, any juices and peanut sauce, stir well, cover again and let stand for a minute or less. Turn off the heat. Serve immediately, with soy sauce. 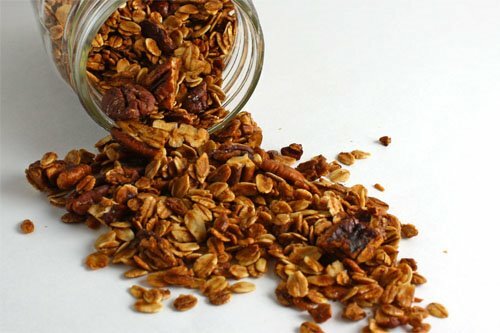 The hardest part of making granola is getting all the ingredients together! But if you make this frequently you can get organized, buy in bulk to keep costs down, and store everything together in the cupboard. Assembly can then be under 10 minutes, with cooking time on top of that. This is the recipe that originated with my mum, was further modified by my sister, my niece, and lastly by me. Feel free to substitute your own favourite nuts, fruit or seeds. We’ve cut oil and sugar to the minimum – any less and you just don’t get that toasted, crunchy texture. Preheat oven to 350˚F. Then measure the wet ingredients into a small pot and warm them on low as you add all the dry ingredients, except the dried fruit, into your largest mixing bowl. Throw them all in there, then mix them well with both hands. Add the warm liquid and stir with a spoon until everything is a well covered. Divide into two roasting pans, and put them in the oven. Bake for 15 min (set a timer so you can do something else), remove and stir, bake for 12 min, remove and stir, bake for 10 min, remove and add the dried fruit. The granola browns as it cooks, but mostly at the end, when you should watch it carefully. Experiment with the timing until you get the roast you like. One thing you can’t do: just set a timer for 30–40 minutes and walk away. Your granola will burn on top (or on the bottom) but be undercooked in the middle.